Gold Plated. St Jude is one of the most Miraculous saints, this pendant looks fantastic. look at the pictures for details. look the details. viene con una cadena de 24" estilo Figaro tambien Gold Plated de muy buena calidad. Condition is Pre-owned. Total weight 6.3 grams. RRP £29.95! 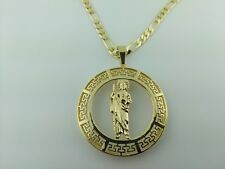 VERSACE STYLE 18CT GOLD PLATED. Pendant Length 2.5cm. Pendant Width 2cm. 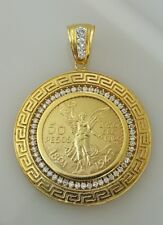 Real 14K Yellow Gold 5mm Wide Diamond Cut Rope Chain W Pendant. Shipped with USPS First Class Package. 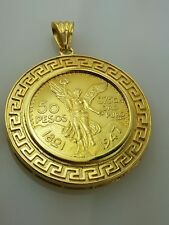 New in box 100% guaranteed official Versace pendant necklace or money back. High polished Gold-tone finish. Hallmark / Signature on back of pendant. Made in Italy. Overall in good condition. Not noticeable unless looking closely at this specific area. The necklace chains are very versatile. $1750 AUTH. 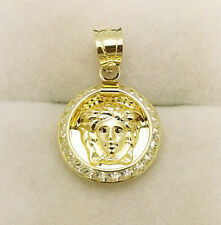 VERSACE GOLD MEDUSA MEDALLION CHUNKY PENDANT CHAIN NECKLACE. Condition is Pre-owned. Shipped with UPS Ground. 24K plated chain necklace as seen on Bruno Band Super Bowl 50. total chain length 28". Chain necklace. Necklace length: 55 cm / 22". Made in Italy. VERSUS VERSACE. - Silver-toned chain. - Solid black color. You can customize the following things given below Engraving (No. of characters will subject to size and space in the jewelry).